In the beginning of our homeschooling endeavor, the Lord told me to really focus in on Science and Social Studies and that Math and Language Arts would naturally happen. I didn’t truly understand what that meant, but I have learned to trust the Lord when I have heard Him so clearly. For our social studies focus, I put together a unit on US Symbols (click here). Science was a four week study of Force and Motion, which I purchased from teacherspayteachers.com, with a two week focus at the end on gravity and magnets (click here). Math was a little more interesting. I have ended up simply teaching to the standards. Mason has always been very good at addition and so we have been focusing on making the “adding to 10” facts second nature. Instead of thinking about them and having to “add them up”, I want him to be able to see them and know them immediately. The following are the steps we used to explore these combinations of 10. I left them as steps so that you can combine them in whatever timing works best for you. Steps typed in the same color are what we did on the same day. Using a ten frame chart and double-sided counters, I asked Mason to find all the different combinations that added to 10. 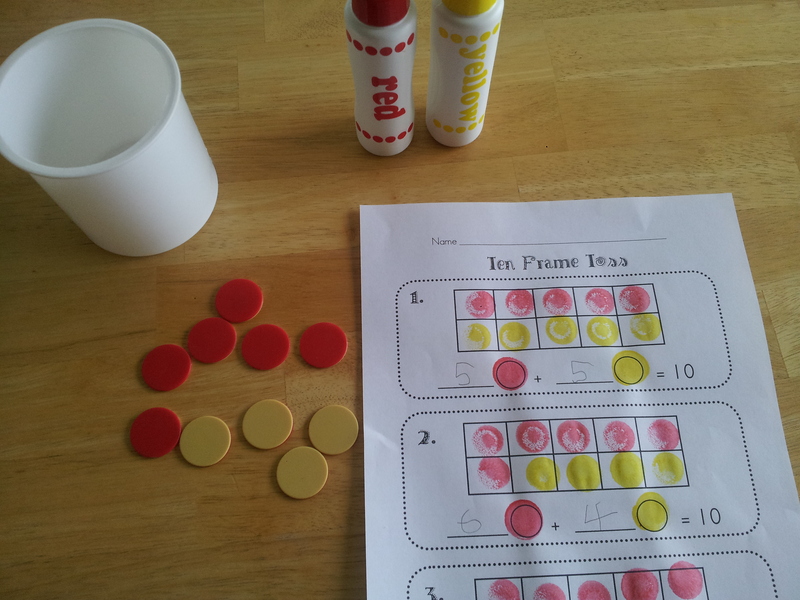 I showed him one example (1 red, 9 yellow) so that he understood how to use the two colors to show the equation. As he found the different combinations, we used our washable Dry Erase Markers to write them on our “white board” (a page protector with a piece of white cardstock). I labeled the “white board” at the top with an R + Y = 10, just to throw some algebra connections in there. As we got to the end, he really started using the recorded combinations to see what he might have missed. Do a short mini-lesson on combinations that add to 10. I used this fabulous “Rainbow to 10 lesson” found at A Cupcake for the Teacher. 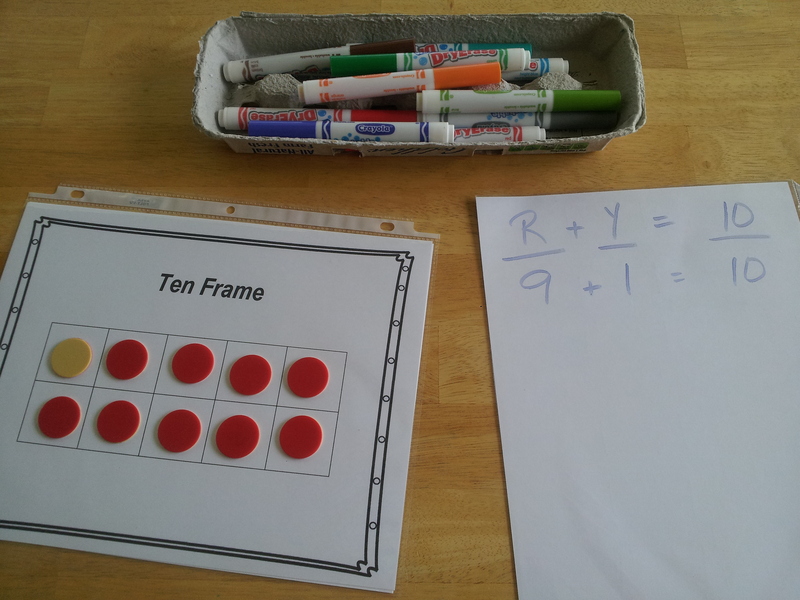 It is a wonderful visual to help students remember all of the combinations that will add to 10. We don’t have a large whiteboard or easel paper, so we used our Window Markers and back door! We left the information on the door all week so he could refer back to it as needed. 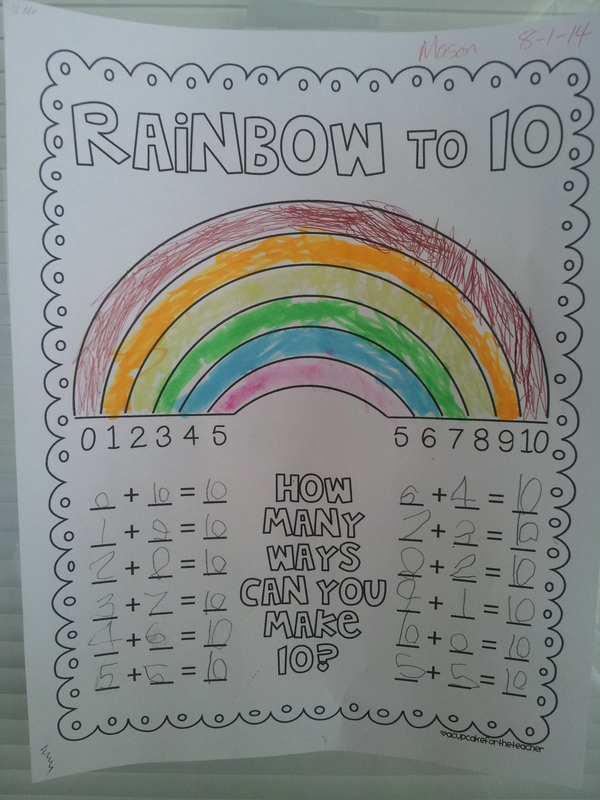 Continuing with the “Rainbow to 10 lesson” materials, Mason colored and filled out the blank Rainbow to 10 worksheet. This was great to begin to solidify these math facts, moving from concrete manipulatives to number representation. 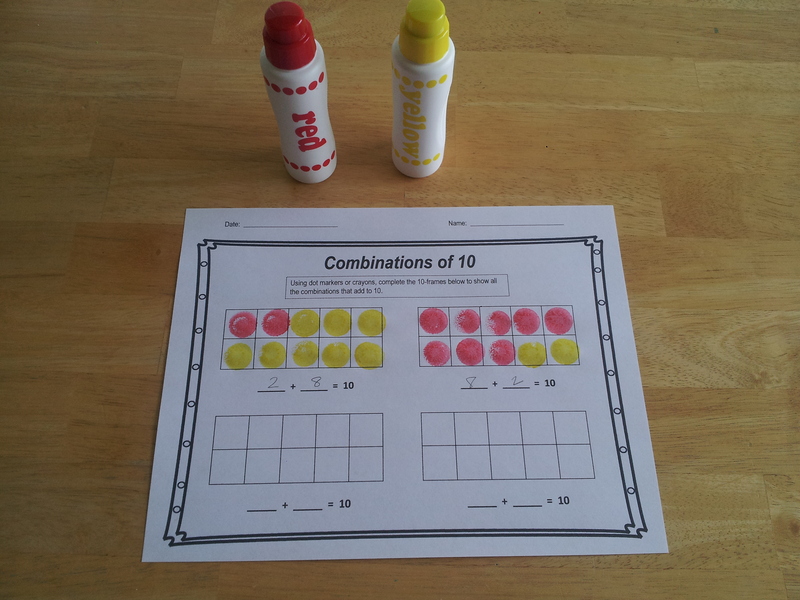 Using the Combinations of 10 worksheet I created, Mason used dot markers to show all the facts that add to 10 (as well as a bonus question to begin thinking of the number 20). We played a fun Ten Frame game over at Mrs. Ricca’s Kindergarten blog. Again we used the dot markers, but crayons/markers/colored pencils work just as well. I printed two or three sheets and he had a blast. Using a 10-sided die or this virtual 10-sided die, Mason completed the Adding to 10 worksheet. We ended with a set of flashcards. I developed this set specifically to be both a practice tool as well as an informal assessment. I wanted to see how familiar and second nature these facts of 10 had become, so I created the flashcards with half “add to 10” facts and half other simple addition facts. As an assessment tool, I held up the cards so that I could monitor the speed and fluency at which he knew the “add to 10” facts. I listed steps that can all be done separately or combined to create longer lessons. Every learner is different and will be able to accomplish a different amount of learning in one setting. Feel free to use each step as needed.